Iowa State University student Ian Butler rehearses the role of Orpheus for “Orpheus and the Underworld,” presented by ISU Theatre and Opera Studio and opening November 1. What happens when a group of bored Roman gods arrive in Hades searching for saucy, bacchanalian revelry? Find out when “Orpheus and the Underworld,” one of the most satirical and hilarious operas of all time, brings a universe of cheeky exuberance to Fisher Theater in Ames. This comic romp opens on Thursday, November 1 at 7:30 p.m. and will run through Sunday, November 4. Every three years, ISU Theatre and Opera Studio collaborate to perform a full-scale opera during the ISU Theatre season. “Orpheus in the Underworld” should appeal to traditional opera lovers and new fans alike, Brad Dell, director of ISU Theatre, said. “For someone who has never seen an opera before, this show is a fabulous gateway drug,” Dell said. The opera has the spirit of “Moulin Rouge” and “Mardi Gras” and delivers light, boisterous fun from start to finish. “Orpheus in the Underworld” opens on Thursday, November 1 at 7:30 p.m. with additional evening performances on November 2 and 3 at 7:30 p.m. A matinee performance will be held on November 4 at 2:00 p.m. All performances are in Fisher Theater in Ames. Tickets are available through the Iowa State Center Ticket Office, all Ticketmaster locations or the Fisher Theater box office prior to performances. Tickets are $25 for adults and seniors and $16 for students. For more information about ISU Theatre, visit www.theatre.iastate.edu, email isutheatre@iastate.edu, or call 515-294-2624. ISU Theatre is funded by ISU Student Government and supported by the Transforming Liberal Arts and Sciences Endowment. As a part of the Iowa State University Department of Music and Theatre, ISU Theatre seeks to empower citizen artistry by engaging students and the community in transformative theatre and performing arts experiences which examine the human condition, encourage lifelong learning, teach artistic skills, prepare professionals, inspire empathy, explore creativity, build relationships, and embrace diversity. 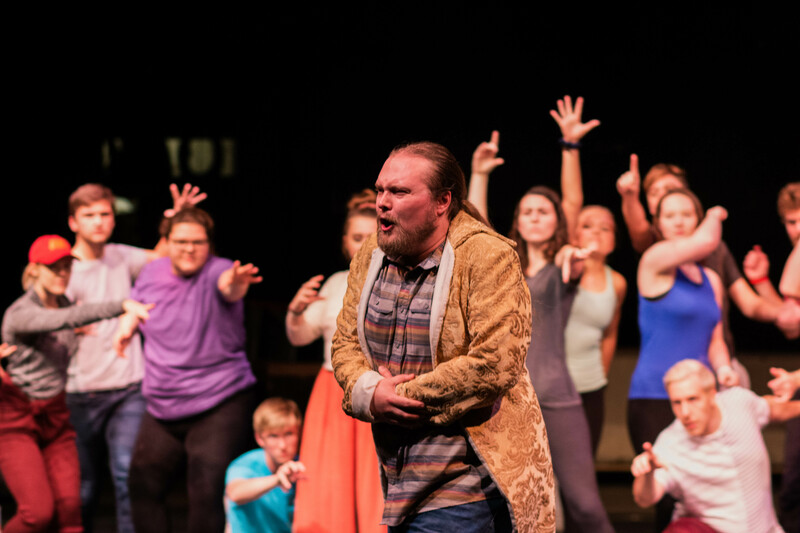 ISU Theatre administers a major and minor in performing arts and produces multiple theatre and performing arts productions throughout the year featuring performers, designers, and technicians from throughout the university. The ISU Theatre CoLab Initiative seeks to foster collaboration and engagement between ISU Theatre and other groups both within ISU’s campus and throughout the broader community to create citizen artistry, inspire and be inspired by meaningful public discourse and expand opportunities for ISU students, faculty and staff.